Trick-or-Treating is a much-anticipated event for most kids, but it can be nerve-racking for fathers who worry about keeping their kids safe. Dr Luz Adriana Matiz, a pediatrician with New York’s Presbyterian Hospital says speaking with your kids about safety is an important piece of parenting advice. "It’s important not to create too much fear in your children when you speak to them about Halloween safety. But it’s also essential that they understand that precautions must be taken," she says. Experts recommend fathers should go trick-or-treating with their children. If your kids are older and insist on going out alone, encourage them to go with and stay in a group. Remind them that they should never go into someone’s house or apartment as well. Matiz also says you should tell your children not to eat any treats before you have a chance to examine them. Look for and throw out any unwrapped foods or things that just don’t look right. In addition, costumes should fit properly and be made of non-flammable materials. Make sure masks have proper eye holes and enough ventilation. 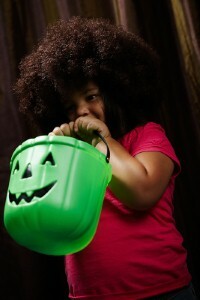 Reflectors, glow sticks and flashlights are important for nighttime trick-or-treating. And, make sure to remind your children about proper street-crossing safety.